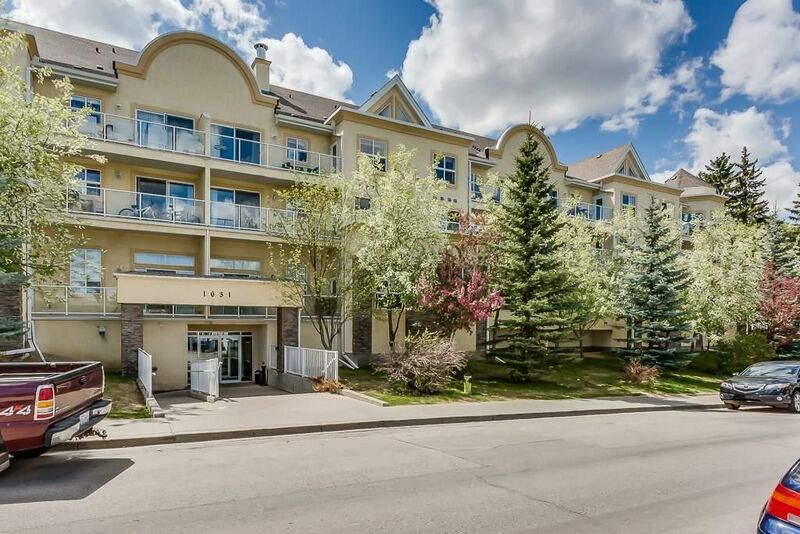 This immaculate 2 bed/ 2 full bath condo offers a convenient inner city location close to down town, 17th Ave, River Park (dog park), Sandy Beach & all the trendy shops & restaurants of Marda Loop. Perfect for the urban professional, this unit features a modern open floor plan, large windows, 2 full bathrooms, HE in-suite laundry, 2 lg balconies with gas BBQ hookup, gas fireplace, separate storage & titled, heated underground parking. The master suite offers plenty of room for a King bed, walk-through closet & 4 pc en-suite with soaker tub & walk-in shower. The kitchen is open to the Great Room with granite tile counters, maple cabinets & black appliances. The dining area easily fits a full size table. Laminate floors throughout the Great Room, carpet in the bedrooms, tile in kitchen & baths all with in-floor radiant heat. Freshly painted & move in ready! Quick possession possible.